Traditional Health Practices in Cameroon. Traditional Health Practices In Cameroon Healthcare System. Relative to Western nations, healthcare in Cameroon is very much lacking. The situation is even worst in the rural parts, villages and regions of the country. In-fact most villages depend solely on indigenous traditional medicines for healthcare. Traditional medicine is fundamentally based on the belief that herbs can cure lots of diseases afflicting humans. This form of treatment can be very efficient, if properly admitted. In-fact most pharmaceutical use this great in their research and development efforts for new treatment options. Readily available to all, regardless of status in society. I personally have benefited greatly from my mothers ability to record most herbal treatments for some common sicknesses be befell me. Thank you mum. 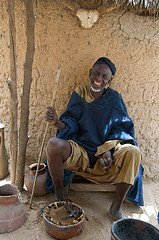 Cameroon Traditional "Melicine Man" or country doctor dabbling with the occults. However, like modern medicine traditional medicine has its drawbacks too: Quantity, timing, disease staging are all arbitrarily done. To make things even worst, anyone can claim to be a traditional doctor. All they need is to put up a sign post and people will come to consult the very day. The severe economic conditions in Cameroon has made this a viable option for many scrupulous individuals from Cameroon and neighboring nations to make a living for themselves at the detriment of the poor and ignorant. The attraction of the people to this form of healthcare is primarily the cost. The traditional doctors or "melicine man" as they are commonly called demand just a few cents to a few dollars( one to five). Any goods their clients or patients brings is also an acceptable form of payment for services rendered. The lack of regulation on the practice of traditional doctors puts the most disadvantages people in the Cameroonian society at risk. There is no follow-up, record-keeping or accountability of any kind on the practice. Due to Cameroon's rich biodiversity, this African country has proven to be a heaven for traditional doctors from all over African and for modern pharmaceutical drug research efforts. For instance, Cameroon Korup national park has the largest tree specie of any rainforest in the world. It is of interest to United state's National Cancer Institute for the plant Ancistrocladus korupensis for its fight against AIDS. Cameroon Korup National park is the largest and most famous project ever by World Wide Fund For Nature (WWF).